This crochet pattern comes with complete instructions for this Simple Bandana. 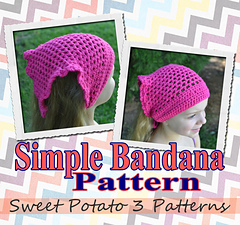 What a fun, cute way to keep your hair back while working or just wear as a cute hair accessory. This is also a great way to help you use up your yarn stash. This pattern may not be redistributed in any way. Finished items may be sold, but please refer back to me as the patterns designer-thank you. Images may not be reused in any way without permission from Sweet Potato 3 Patterns.